Intel's tie-in website with the new movie has been updated with an interactive spinning model sort-of-thing of the USS Kelvin, which has various little details you can look at to get technical specs. The text descriptions seem nice and loyal to Trek-tech lore, though reveal some curious details about the arrangement of the ship. The top section, with the deflector at the front, appears to be mainly a huge shuttle bay, while the lower section is the warp nacelle, though from the description might be the entire warp engine: "The Kelvin has a single warp nacelle housing the ship's warp drive engine. Two rows of massive semi-circular warp-field coils produce a powerful subspace field that bends space around the ship, allowing for faster than light travel." So some sort of engineering section-warp nacelle hybrid? 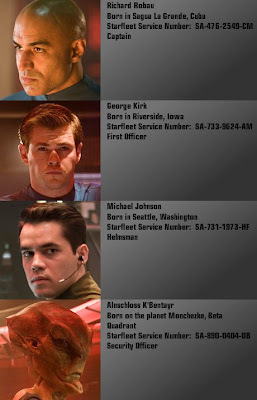 The pop-up menu's also give as a look at crew, in their pre-TOS uniforms, which like the new main-TOS era uniforms seem to have remained reasonably loyal to the original Pike-era uniforms but with a contemporary twist. Check out the Kelvin section of the site to explore the rest of the details of the ship. So are they saying that Kirk's dad was on the Kelvin?